Before we discuss what a Revocable Living Trust is, let’s start with discussing with a Trust is. Think of a Trust like a “rule book” that you create. The rule book is attached to a box in which you’ve placed certain items. Within the rule book, you have set forth instructions about how you want the items in the box managed, including who has access to use the items in the box. Within the rule book, you also appointed a referee to enforce the instructions contained in the rule book. In legal terms, a trust is a legal entity set up by a “Trustmaker” (sometimes referred to as a grantor or settlor). Within the trust document, the Trustmaker designates a “Trustee” to hold and manage assets on behalf of certain “Beneficiaries” specified within the trust document. A Revocable Living Trust is used to describe a Trust that has certain characteristics—the most obvious being that it’s revocable—meaning that the person that established the trust and change their mind at any time and undo the trust completely. As the Trustmaker, you have the power to change, modify, or terminate the trust at any time in the future. As the Trustmaker, you can add new assets to the trust at any time or you can take assets out of the trust at any time. A revocable living trust does not require any separate tax filings. You name back-up Trustees to serve in the event that you become incapacitated or die. The revocable living trust specifies what should happen to the trust assets upon your death (this is why many people think of a revocable living trust as a substitute for a Last Will and Testament). Provide instructions for how your assets should be managed if you should become incapacitated—including providing that the Trustee can use your assets to provide not only for you but also for your spouse or children. Providing instructions for the handling and distribution of sentimental items and family heirlooms. Leave assets to a surviving spouse protected in the event that the surviving spouse gets sued or needs long-term care. Leave assets to a surviving spouse protected in the event that the surviving spouse gets remarried or divorced. Leave assets to children or other beneficiaries protected from future lawsuits, creditors, or divorce. Include provisions to fund educational expenses for your children or grandchildren. Include substance abuse protections in case a beneficiary is afflicted with a substance abuse problem. Appoint a trustee to manage assets on behalf of young or financially irresponsible beneficiaries. Provide rewards or incentives for certain behavior such as educational achievements, starting or purchasing a business, buying a first home, or similar. 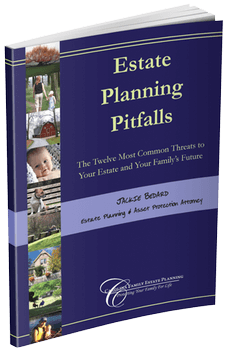 Foundational estate tax planning for married couples to ensure that as a couple they pass as much wealth to their beneficiaries free of estate taxes.